Thanks for playing World Golf Tour this year! We're celebrating the season with a special holiday gift for all our players. 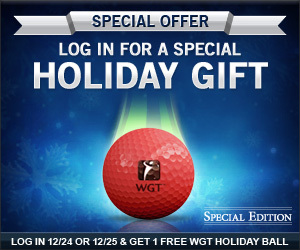 Just login to your WGT account on Christmas Eve (12/24) or Christmas Day (12/25) and you will automatically get 1 free virtual WGT Holiday virtual golf ball, just for playing. These festive red WGT Holiday Balls are available for a limited time only, and are based on the popular WGT GI-SD virtual golf balls, with extra distance and control on your shots…plus a little holiday cheer! To equip your bag with the WGT Holiday Ball, just click on the My Equipment option under My Settings from the Main Menu, and "click and drag" the ball. See this video tutorial for help. p.s. the WGT Holiday Ball also makes a great gift for your friends on WGT! Just for the holidays, WGT has launched a special high-stakes Ready-Go online golf tournament on Bethpage Black. This limited-time high-stakes tournament has a $50 entry fee with the lowest score earning 6X credits and the top 30 of 50 finishers all getting paid. To play in the current tournament, just find the "Bethpage Black Full 18 Ready-Go" with the 5,000 credit entry fee in the Ready-Go tournament menu. 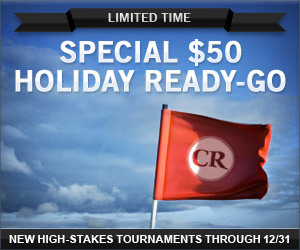 We'll run as many of these limited-time high-stakes Ready-Go's as we can thru December 31. Good luck! Starting today through Sunday, December 18, you can get 3 free NIKE virtual golf balls when you purchase $20 or more WGT Credits. The NIKE 20XI golf balls feature a revolutionary RZN core that delivers more distance, as well as spin and control, and a slower swing meter on WGT...making it easier to hit perfect shots on virtual clubs with faster swing meters. 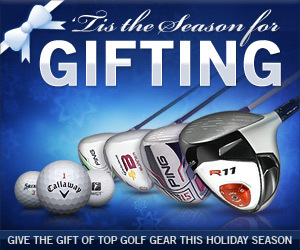 * Unlimited offer available to WGT players who buy $20 or more WGT Credits, to get 3 free NIKE 20XI-X virtual golf balls, now thru 12/18/11. Check out all the improvements to World Golf Tour, including new NIKE golf balls, new Best-Of Water golf course and new Level-Up Boosts, as well as improvements to Skins Games, Free Surveys and Greens Fees. And don't miss the special offers this month on free balls and a special high-stakes Holiday Ready-Go golf tournament for top players. 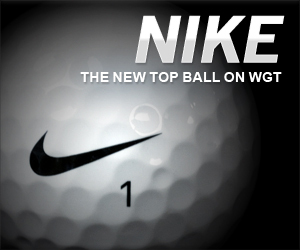 WGT has partnered with NIKE Golf! The latest technology from NIKE is now available on WGT. The new NIKE 20XI ball is the new top-performing virtual ball on WGT with more distance, more control...and the famous NIKE swoosh! The new NIKE balls unlock at Levels 47 and 48, and then at Levels 70 and 71 for the very best players. 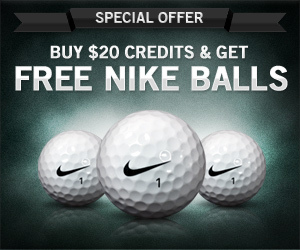 Get 3 free NIKE balls when you buy $20 or more WGT Credits 12/15-12/18 and buy as many times as you want to stock-up regardless of your WGT level. Get 1 free WGT Holiday ball when you login and play WGT on Christmas Eve (12/24) or Christmas Day (12/25) for more distance and control in fun holiday colors. Compete with top players in the special Holiday High-Stakes Ready-Go Tournaments with a $50 entry fee, now thru 12/31. You can now jump to the next WGT Level to unlock new equipment in the Pro Shop. New WGT Level-Up Boosts cost from 100 to 300 credits depending on your Level. 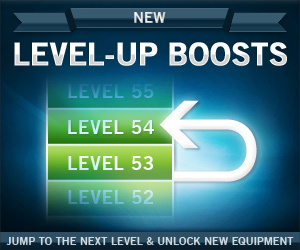 Unlike XP Boosts which help you gain extra XP as you play WGT, the new Level-Up Boosts immediately take you to the next level, all the way up to Level 60. Announcing the third new "Best Of" golf course, as voted on by WGT players. 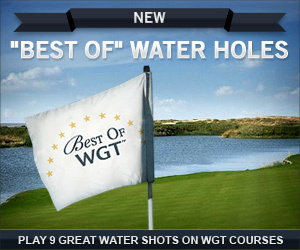 Best Of Water is a free closest-to-the-hole challenge that features 9 of the best water shots from different golf courses, including Wolf Creek, Harbour Town, Edgewood, Celtic Manor and Bali Hai. It is also available for Blitz games. Other WGT Best-Of courses include Best-Of Challenge (9 famous shots) and Best-Of Strokeplay (18 top holes). The new "Skins" multi-player game now has a Pick-Up Ball option to help speed up Skins games. 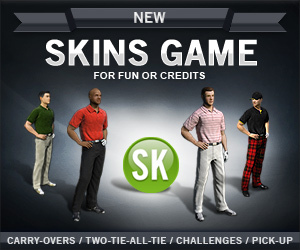 You can play Skins for fun or credits, with features like carry-overs and two-tie-all-tie, that add to the suspense of Skins games. 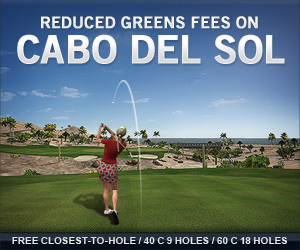 WGT has reduced Greens Fees on the Cabo del Sol golf course from TruGolf. The new Greens Fees are 60 credits for 18 holes, 40 credits for 9 holes, and 0 credits for the closest-to-the-hole challenge. Enjoy the ocean views and birdie opportunities at this Nicklaus-designed resort course in Mexico. 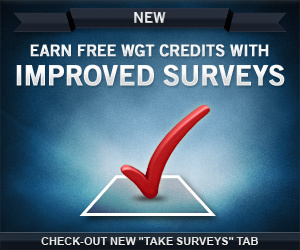 It's even easier to earn free WGT Credits with new types of online surveys, many of which are easier to qualify for. See the new surveys in the Take Surveys tab. Use your free WGT Credits to upgrade your equipment, enter tournaments, and for match play and skins challenges. Play this month for a random chance to win a dream golf trip for 2 to Pebble Beach, including three nights at the Spanish Bay Inn, and rounds of golf at Pebble Beach and Spanish Bay Links, valued at over $3,500. See tournament rules for details and eligibility. 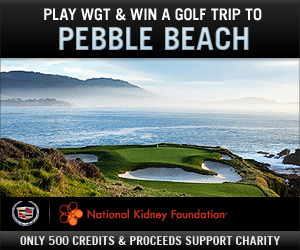 WGT sponsor Cadillac has teamed up with the National Kidney Foundation charity to run the NKF Cadillac Golf Classic tournament on World Golf Tour. It's 500 WGT Credits to enter and proceeds go to the National Kidney Foundation charity, benefiting research and treatment of kidney disease. One lucky player will be randomly selected to win the grand prize. Note, this is not a skill-based leaderboard tournament, all you need to do is enter and post your round for a chance to win. The tournament is a 9-hole closest-to-the-hole challenge on Celtic Manor, site of the 2010 Ryder Cup. 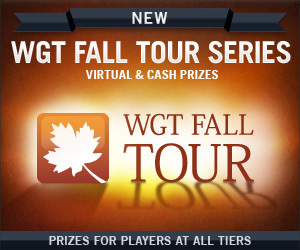 The WGT Fall Tour golf tournament has ended for November, and the winners have been announced! Thousands of online golfers competed in the November Qualifier played on Oakmont, and the top 100 players (plus ties) qualified for the November Championship played on St Andrews and Royal St George's this week, with the Top 10 combined scores earning $100 Amazon Gift Cards. For your chance to win, be sure to play in the December Qualifier anytime this month. Good luck! Don't forget your WGT friends this holiday season! It's easy to gift virtual golf items in the WGT Pro Shop to your friends, including golf balls, wedges, putters, drivers, XP boosts or avatars. Perhaps a Putter Pal for your WGT friends who need a little extra help on the golf course greens. After sending gifts, challenge your friends to a virtual strokeplay golf game on Congressional Country Club! Start the season off right by gifting your friends on WGT!